With a commitment to quality and effectiveness, SuperPump 3.0 is sure to make waves in the sports nutrition industry. SuperPump 3.0 is the real the deal for increasing a true pump, strength, endurance, and energy. It will be a great asset to many types of athletes and bodybuilders. It’s been many years since a product like this has come to our market, said CEO Rich Gasp. Gaspari Nutrition®, a globally distributed sport nutrition company, is proud to announce that they are set to launch SuperPump® 3.0 at this year’s 2014 Arnold Classic. The pre-workout brand has enjoyed a long history of global success over the years when it broke onto the pre-workout sports supplement scene with Superpump250 in 2006 and then later with SuperPump MAX. Ramping up for global distribution, the buzz in the industry and among sports nutrition enthusiasts is growing exponentially. “Superpump 3.0 is the real the deal for increasing a true pump, strength, endurance, and energy. It will be a great asset to many types of athletes and bodybuilders. It’s been many years since a product like this has come to our market,” said CEO Rich Gaspari. The SuperPump brand has enjoyed numerous accolades over the years including multiple Bodybuilding.com and Popeye’s Supplement Canada awards and nominations. Gaspari has also funded numerous clinical research studies on the SuperPump brand to demonstrate the safety and efficacy of the formulations as well. It’s this commitment to quality and effectiveness which has supported the SuperPump brand’s popularity among athletes and bodybuilders around the world. To ensure formulation excellence, the Gaspari product development team developed partnerships with key industry players such as Glanbia, Nutrition 21, Compounds Solutions, and Alzchem to create this powerful formulation. One of the key featured ingredients is inositol arginine silicate (Nitrosigine™) under license from Nutrition 21 and distributed by Glanbia Nutritionals. Nitrosigine™ is a brand new ingredient to sports nutrition with human clinical data to support its efficacy and even a NDI “no objection” ruling from the Food and Drug Administration. “Leveraging our key ingredient partnerships is the cornerstone of success for every product our team develops. We took this to the next level by sticking to Rich’s core belief that the Gaspari Nutrition product line be based on relevant human performance research and the ingredient doses validated by that body of research to create Superpump 3.0,” said VP of Business and Product Development, Daniel Pierce. If you plan on attending the 2014 Arnold Classic then don’t miss your opportunity to try out Superpump 3.0 and experience it for yourself. 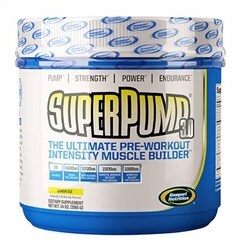 For more information regarding Superpump 3.0 be sure to follow Team Gaspari on Like GaspariNutrition on Facebook, Instagram, Twitter, or sign up for the their enews at http://www.gasparinutrition.com for the latest updates about the up and coming launch. Gaspari Nutrition is headquartered in Lakewood, NJ and is a rapidly expanding, healthy lifestyle sports company that develops and distributes a full line of nutritional supplements. Gaspari’s propriety and award winning products address all categories of an active lifestyle including muscle building, weight loss, and general fitness through a daily nutritional supplement regimen. They are one of the few companies to sponsor independent, 3rd party research on their products to prove their efficacy. Gaspari Nutrition is sold in over 85 countries, including over 85 Popeye’s locations in Canada, and available in over 5,000 US retail outlets that include GNC, Vitamin Shoppe, and Kroger, as well as over 100 online stores, including Bodybuilding.com, Amazon, DrugStore.com, and SupplementsCanada.com. For more information, please visit http://www.GaspariNutrition.com.